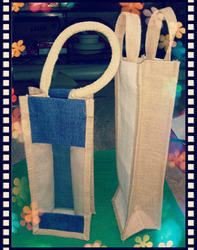 We can make Jute Wine_Bag for single bottle, double bottle, 4 bottle and 6 bottles . The bag is one window or two window based. Handle is used in cotton rope, and cane handle. Packing : in carton ox. Minimum order : 1000 bags in one lot. 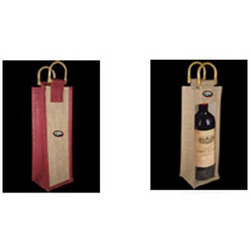 We are the Leading manufacturer of Jute Wine Bag . We can Manufacture Single bottel to SixBottels. We manufacture and supply an excellent range of Jute Wine Bags that are designed by our experienced designers using finest raw material. These bags are to carry wine bottles and are highly appreciated for their features like strong and comfortable handle, storage capacity and long service life. 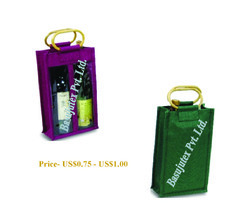 These Jute Wine Bags are available in different patterns, prints, symbols and logos to satisfy the demands of clients.